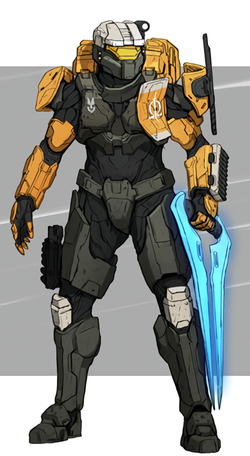 Leon-011 is a Spartan-II commando and a member of Omega Team. Like the other SPARTAN-IIs, Leon-011 was abducted at age six and conscripted into the SPARTAN-II program in 2517. He later survived the augmentation procedures in 2525. Along with Robert-025 and August-099, Leon formed the Spartan-II fast reaction unit Omega Team. Leon specializes in and is equipped for close-quarters combat. At some point, he began using a custom energy sword. Leon's name (Λέων) means "Lion" in Greek. A detailed concept sheet of Leon-011 for Halo Wars 2. Leon (left) alongside his teammates. Leon being used in multiplayer.